Robert is doing very well ~ now getting physio and occupational therapy and seems to have dealt with that frightening chest infection (and other smaller infections) very well. Lost a couple of pounds over the pneumonia episode and trip to SVUH ICU but he’s being cared-for beautifully by the NRH as ever. They’re watching him like hawks and pouncing on anything they think might give him any trouble. God bless them. 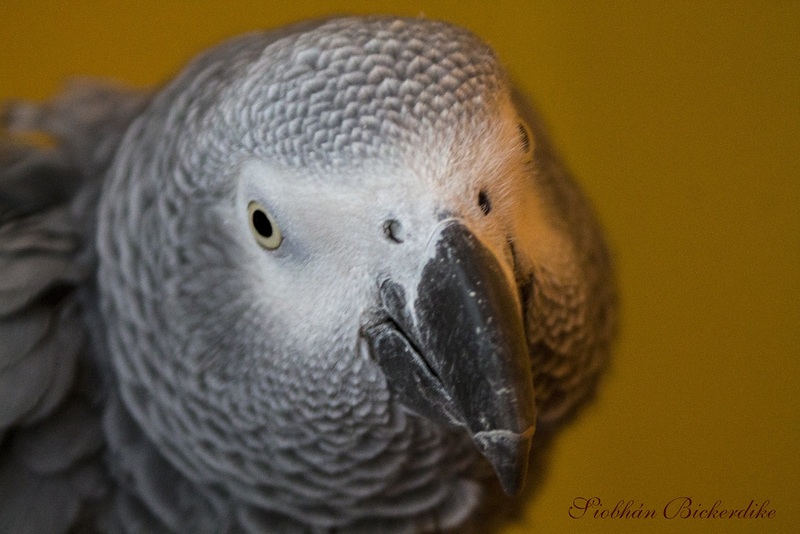 Our African grey parrot Paulie has gone to her foster family in Longford, and I’m now really and truly home alone. She was great company for me but I felt guilty if I did anything outside the home: meeting a friend or having lunch out – I felt like I was neglecting her and felt bad for not spending that time with her. Also, Robert would be very upset if he thought she wasn’t getting what she needed. So, with Ritamary’s kind assistance and that of the Irish Parrot Society, we found a lady who wanted to foster a parrot and, after meeting and visiting Brigid, we brought Paulie to her on Friday evening. It’s a great consolation to me that Paulie is with this remarkable woman and her smashing son Eoin: Brigid is an animal lover beyond anything I’ve ever seen and manages to maintain six bichon frise dogs, a chihuahua, five rabbits, five (six?) cats, two budgies, two miniature ponies and seven gypsy cob horses. And she works outside the home. Eoin is a student and the chef in the family: five minutes after we had Paulie’s cage assembled Eoin had provided snacks and wine and was reading up on Paulie’s diet. Brigid very kindly put us up overnight so we could settle Paulie in and meet with Siobhán Bickerdike who works with the Irish Parrot Society, a parrot breeder/owner/carer, a photographer (see her work here: http://simplephotograph.wordpress.com/2012/12/15/stalker-at-the-window/) and who is also involved in the dramatic arts. Siobhán knows more about parrots than anyone I’ve ever met, and has an African grey of her own called Liath who sounds like a real character. Siobhán will be on hand for Brigid if she needs any advice. 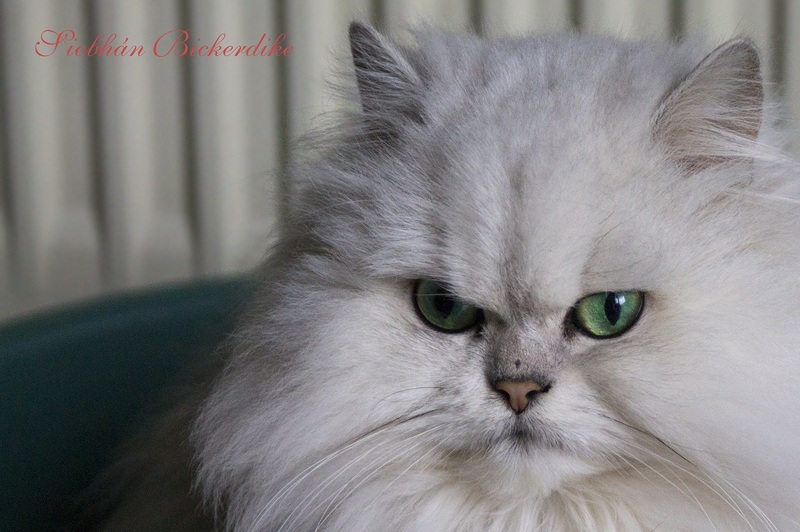 One of Brigid’s prize-winning Persian cats ~ don’t worry, she’s not interested (or close to) Paulie! So, thank God for Ritamary, Brigid, Eoin and Siobhán. Again I find myself full of gratitude to people that I didn’t know six months ago who are helping us out and giving me a breather. It will make a difference to how I go about my day: it seemed like I was vanishing a little more every day. On my list of importance Bob is first, Paulie is second, then chores, housework, etc. Now Bob is even more first and I can spend extra time with him – and some time with myself. I have become a bit of a loner. There’s not a whole lot I want to do. I’ve joined a gym so I can have a swim and work out some of the stress that being broken-hearted produces. Tonight I took a ‘boxercise’ class, hoping that I’d get to punch something, but that isn’t how it works. However, the class leader was a tough woman and kept us going for 45 minutes of unexpectedly hard work. I pretended I was punching something. Then I had a swim and came back in time for work. The main thing now is that Robert is improving from his New Year illness and doing really well. So proud of him. He has shown me that he’s fighting, I’m not alone in this battle, and as always I’ll take my cue from him. Hi Angela. Nice to catch up on your blog – even though we talk often it helps to ‘read’ it also. Glad to hear that Paulie has settled down. It was lovely to have you with us at Christmas and more recently to celebrate Iain’s birthday. Enjoy the gymn and ‘punch away’ to your hearts content! Love you.